Grimsby is target for long term operations base. innogy SE today confirmed Financial Close for the 860MW Triton Knoll Offshore Wind Farm, announcing the project’s turbine supply contract and the east coast UK ports which will build and service the offshore giant. Triton Knoll has placed orders with world-leading turbine manufacturer MHI Vestas to provide the offshore project with 90 of its V164-9.5 MW machines, currently considered to be the most powerful on the market. Triton Knoll has also agreed a Memorandum of Understanding (MoU) with ABP to use its Grimsby facility as the wind farm’s long term Operations and Maintenance (O&M) base. Studies estimate the O&M work has the potential to support up to 170 direct and indirect long term jobs. Julian Garnsey Project Director, Triton Knoll said it was an exciting day for the project: “This is a great moment for Triton Knoll and the UK offshore wind industry as we formally secure the means to deliver around £2billion of new UK energy infrastructure. Triton Knoll expects to deliver at least 50% of our investment with UK firms over the project’s lifecycle and at the height of construction we expect to see over 3000 people working on the project. MHI Vestas will supply 90 of its most powerful world-leading turbines to the project. Turbine tower sections, blades and nacelles will be assembled at Seaton, before being loaded on to construction vessels for transport and installation at the wind farm, over 30 kilometres offshore. MHI Vestas CEO, Philippe Kavafyan said: “With financial close now reached for Triton Knoll, the UK has again affirmed its position as the global leader in offshore wind. This means highly-skilled jobs in the local offshore wind sector. Able UK will develop an additional 140metres of new heavy-duty quayside at the port, and invest in equipment and facilities to support delivery of Triton Knoll. It says the investment will help the port become a competitive force within the offshore sector and providing considerable opportunities for the local supply chain. Able UK’s Executive Chairman Peter Stephenson, said : “We have enjoyed a long and constructive relationship with Triton Knoll culminating in today’s announcement – it’s a massive vote of confidence in the UK, ourselves and the Teesside supply chain. Our sustained investment means we can provide a bespoke and tailor-made solution for Triton Knoll. Ben Houchen, the elected Mayor of Tees Valley commented: “This announcement underlines the increasingly important role the Tees Valley is playing in the development of the UK’s offshore wind capabilities.Able is already experienced in supporting foundations and installation and will now be able to showcase Able Seaton Port facility (ASP) and the wider area as a world class location for the installation of wind turbines. 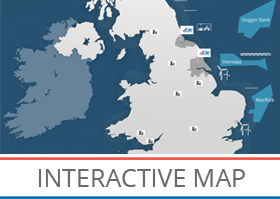 The number of companies that are based in our region that have a strategic role in delivering offshore wind projects means we are on the brink of becoming a centre of excellence for the industry.